Pictured is the home built by T.C. 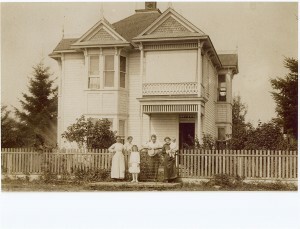 Van Eaton in 1898, located on Rainier Street. It was built after there were sawmills nearby for lumber and was the height of architecture in its day and the finest home for miles around. The dimension lumber came from Andrean’s mill at Muck Creek, and the foundation timbers from the Goe and Tomlin mill on the Little Mashell. At the time it was the highest building in town and situated on a knoll. Originally there was a 110-foot well near the back door dug by Nate Williams with the assistance of Silas Barr, an Indian from Indian Henry’s village. During the 2009 Eatonville Centennial there was a tour a tea at the home. You can read more about the home today in Dixie and Bob Walter’s article. Just click HERE. Pictured are Left to Right: Kate Dutton, Nellie Van Eaton, Jennie Miller, Frank, Susie and John Van Eaton. My name is Bernadine. I´ve just been reading through some papers of my Father who passed away a couple of years ago in Canada. In one of the books, he writes that his grandmother was named Nellie M. VanEaton. I can´t tell but he suggests she was either from North Dakota or BonAccord, Alberta. Is this any relation to Nellie that you have a photo of? Hi The Nellie Van Eaton that was married to TC Van Eaton grew up in Kansas & came to Eatonville around 1907.I don’t think they would be related. If you are interested in anything particular, just let me know. Hi My dad (the baby in the photo) was born 1911 so that’s what I used to date the picture. Hi My dad is being held by his half sister Susie. Hi That was TC’s third wife the frist two died. Is this house listed on the National register of historic places? I’m not sure. It’s owned by Tom Van Eaton, the original owner’s grandson. I know he added onto the house, but not sure if he ever registered it.